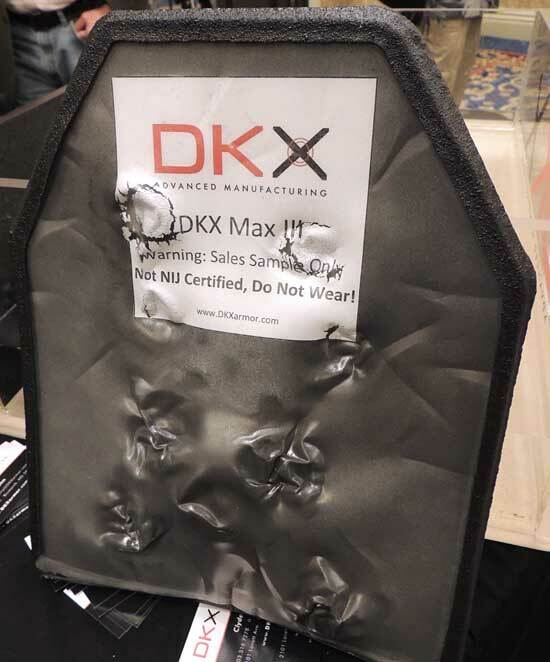 DKX Advanced Manufacturing is on the cutting edge of ballistic protection, offering high grade armor plates for military and civilian applications. The latest products from Advanced Manufacturing are some of the most amazing advancements in armor development I have ever seen. Combining the latest manufacturing technology with the newest polymer advancements, Advanced Manufacturing is offering their DKX line of ballistic armor plates. These armor plates offer some of the highest protection from common rifle rounds while presenting a package that is so light weight you almost forget you are wearing one. The concept of body armor has been around for thousands of years. However, modern police forces, tracing their origin to Sir Robert Peel’s Metropolitan Police in London in the early 1800’s, have been much slower to embrace an image to protect officers with “military” style armor. It wasn’t until 1976 that Richard Davis, the founder of Second Chance Body Armor, designed and developed the first law enforcement Kevlar vest. Concealable underneath the uniform shirt, these vests offer discreet protection against most of the common handgun cartridges. An item that is almost universally worn today, was a novelty item less than 40 years ago. However Kevlar alone, has not been shown to have the ability to stop rifle cartridges. 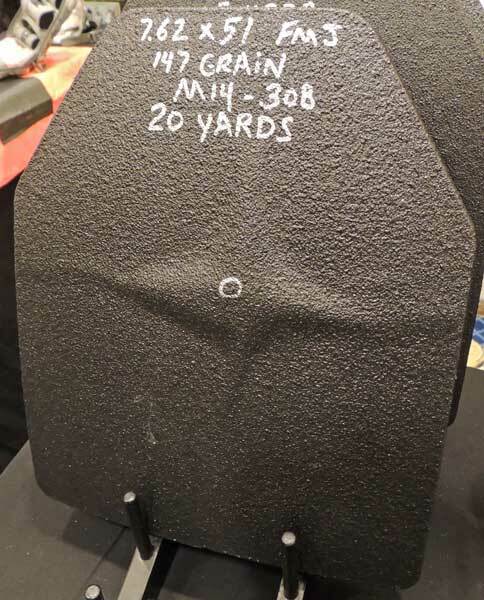 This armor plate took multiple 5.56 NATO rounds at five yards with no penetrations. The same plate as seen from the rear shows little backface deformation. Early rifle-grade armor plates involved steel, and then ceramic configurations. These early designs worked, but at the cost of weight and bulk. 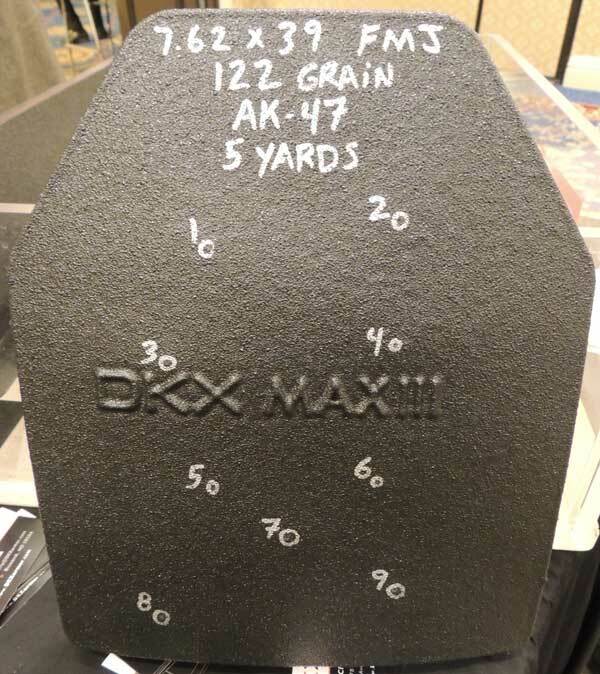 Today, Advanced Manufacturing has developed an armor plate that is capable of stopping 5.56mm and 7.62x51mm rounds, at an incredible weight of only 2.9 lbs. per plate. In fact, company representative Terry Stevahn had a common plate carrier with (2) DKX Max III plates inside at SHOT Show this year. The combined weight of the carrier and plates was less than 9 pounds! 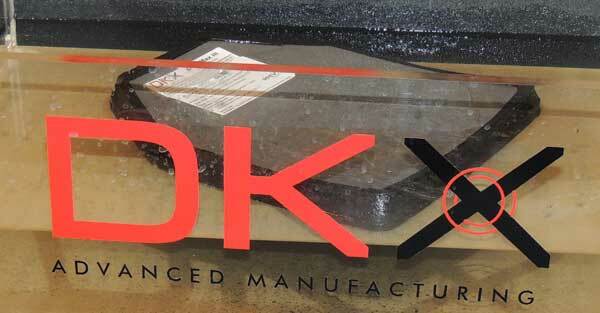 The DKX Max III line uses “Dyneema”, a poly-ethylene mixture, that is compressed under high pressure. This process creates a bond in the materials that is extremely strong. 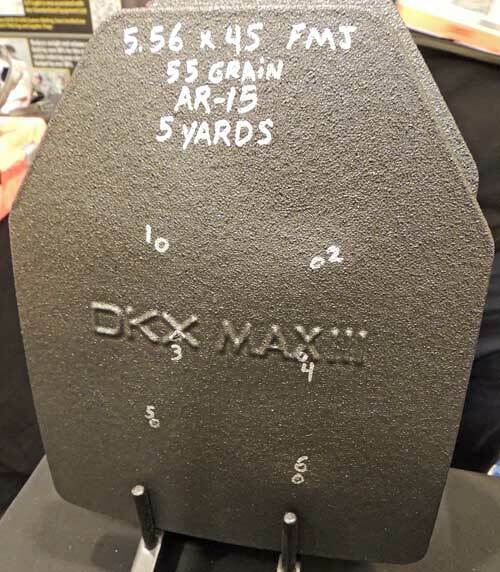 The Max III conforms to NIJ Standard 0101.06 for armor plate protection, As the pictures show, these plates are quite capable of stopping rifle rounds, while maintaining their integrity. (Note: Advanced Manufacturing does not guarantee multiple hits to a plate in close proximity to each other). 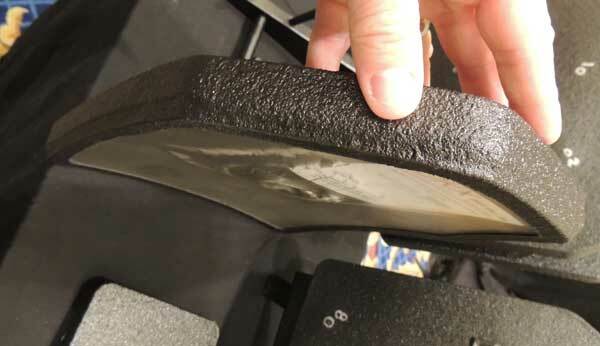 This plate took nine rounds of 7.62×39 from an AK-47. None penetrated the armor. The rear of the same plate struck nine times by AK rounds shows the backface deformation. Usable from -45 to 160 degrees. 5.56x45mm FMJ 55 gr. from AR-15 (5 yards). Impact point of a single 7.62×51 NATO round. The backface deformation from the 7.62×51 NATO round. The DKX Max III is not cheap, but the protection it provides can be worth your life. Recent events foreshadow a possible increase in the use of rifles to perpetrate horrific crimes. Having the ability to face those threats with legitimate, lightweight protection can make the price tag easier to carry.